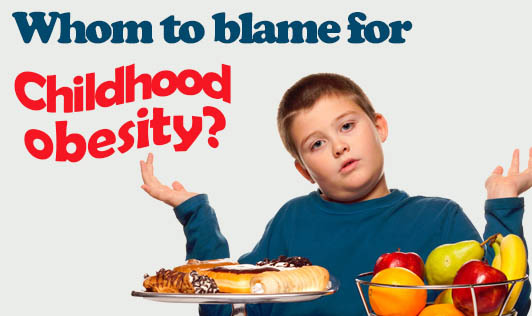 Whom to blame for childhood obesity? "Globesity" is spreading all over. The World Health Organisation has estimated the total number of overweight adults across the world as 1 billion, out of which 300 million are obese. School surveys in the recent past have shown that childhood and teenage weight problems are rapidly rising. Who does one blame for this increasing health problem - the child, the parents, teachers or peers? a) Teach healthy behavior at a young age; older habits are less easy to break off. b) Be a positive role model. Observe lifestyle habits that can contribute to overeating and inactivity in your child; then set a good example. c) Limit portion sizes; don't force-feed your child. d) Make an effort to cook with less fat and less sugar; implement healthy changes for the entire family. e) Replace refined foods like maida, white bread, white rice with whole wheat flour, whole wheat bread and brown rice. f) If you snack on fruits and salads, your child is likely to follow the same. g) Be physically active - Include at least 30 minutes of dedicated exercise time for: 6 days a week along with your child. If you make excuses to avoid workouts; your child is likely to do the same. Involve your child in activities like gardening; trekking, car-cleaning, running errands, etc. h) Restore the dying habit of family meals with no TV, no reading, no other activities apart from eating and spending quality time together. i) Don't use foods as rewards, or to cover your guilt of not spending enough time with your child. j) Make sure the dietary and activity changes are subtle and easily acceptable. k) Help your child build a positive self-image. l) Above all let your child know that he/ she is loved, no matter what. m) Don't underestimate the health risk of excess weight to your child and don't give up the battle of the bulge, even though it might take time.